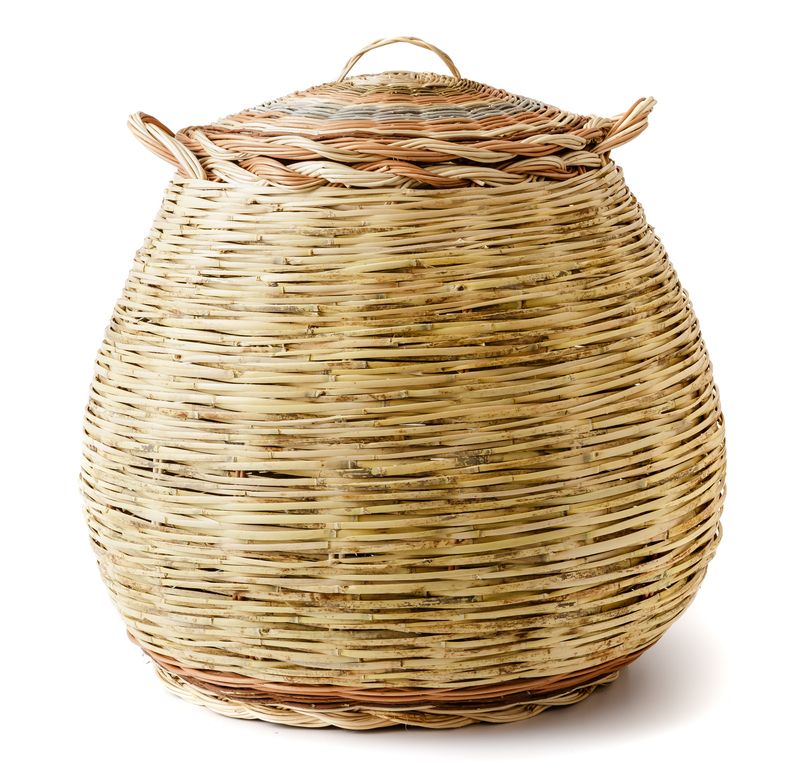 This rounded wicker basket and its top are made with Mediterranean maquis branches with vibrant colour combinations. 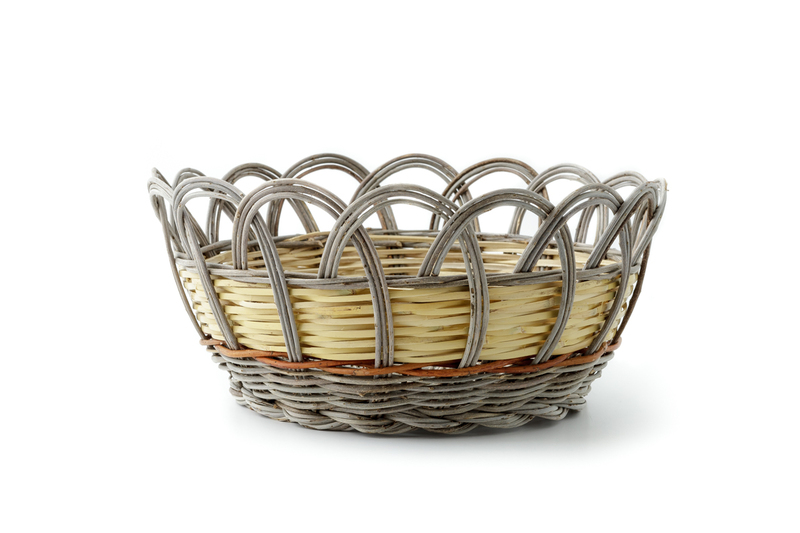 Basket featuring an arch-decorated edge, intertwined with Mediterranean maquis branches: oleaster, reeds, willow and mastic tree. The combination of natural materials provides for its chromatic variations. 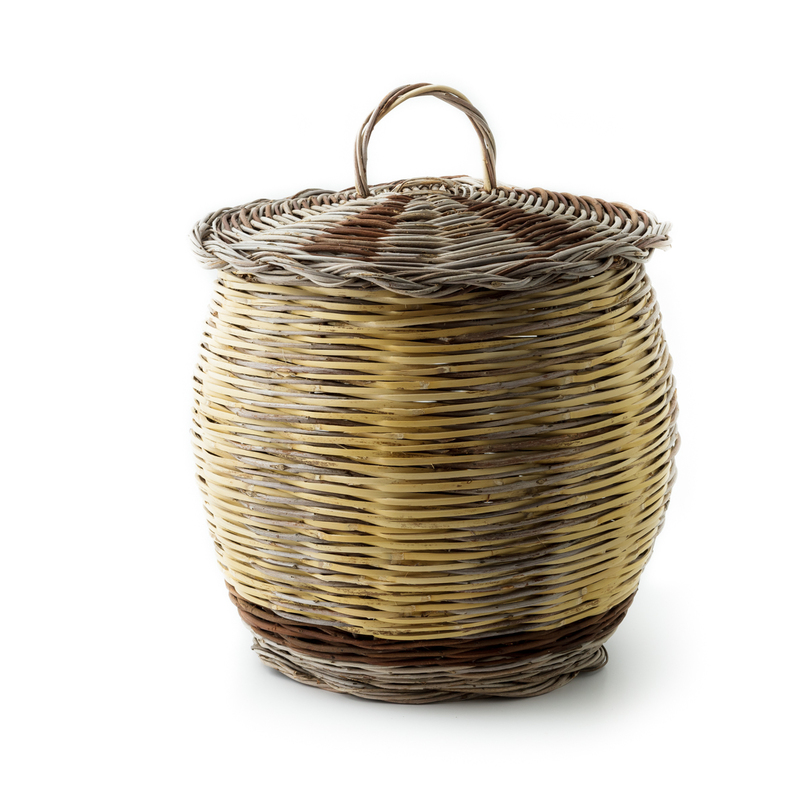 Capped container, woven with non-local reeds. Natural white with black bands, dyed with vegetal colours. Being keepers of a past rich in traditions and secret manufacturing techniques, local weaving productions are a means to preserve knowledge and open up to innovation. Skilled hands intertwine evocative artefacts created with traditional shapes and decorations. 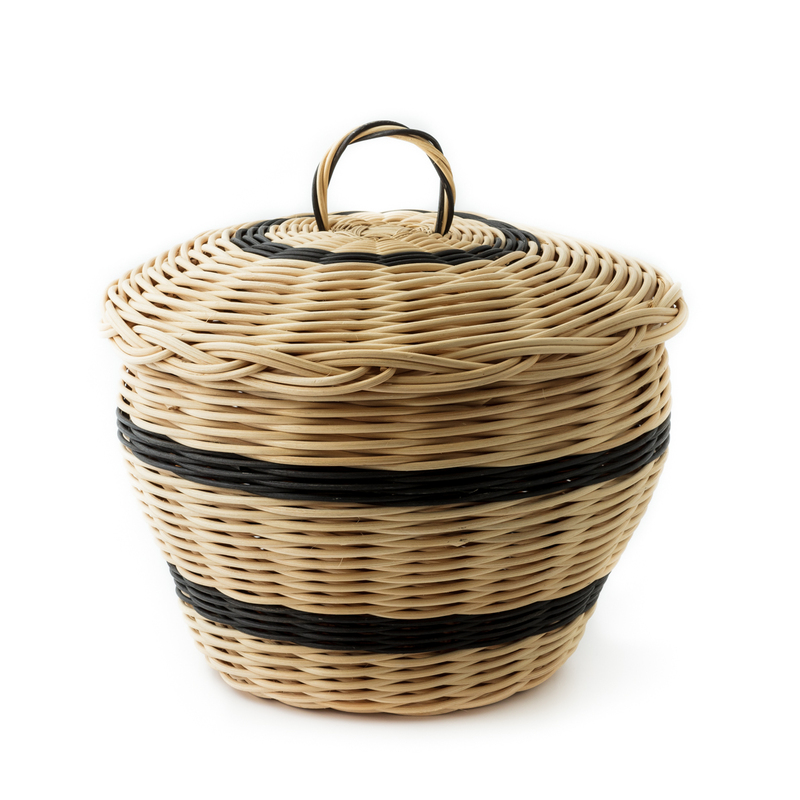 Fine and exclusive functional containers are used and appreciated with pure aesthetic sensitivity. Tradition made a distinction between two types of craftsmanship: one dedicated to men, with a more solid touch typical of rural areas; and one dedicated to women, finer and decorated, intended for domestic use. Local nature, characterized by the thriving of the Mediterranean maquis, has always provided excellent raw materials. It recalls the sea and the sand, reeds, the fields and the sun, asphodels and the hay, myrtles, lentisks, Mediterranean dwarf palms and the thatch. Forms vary with a range of different functions. 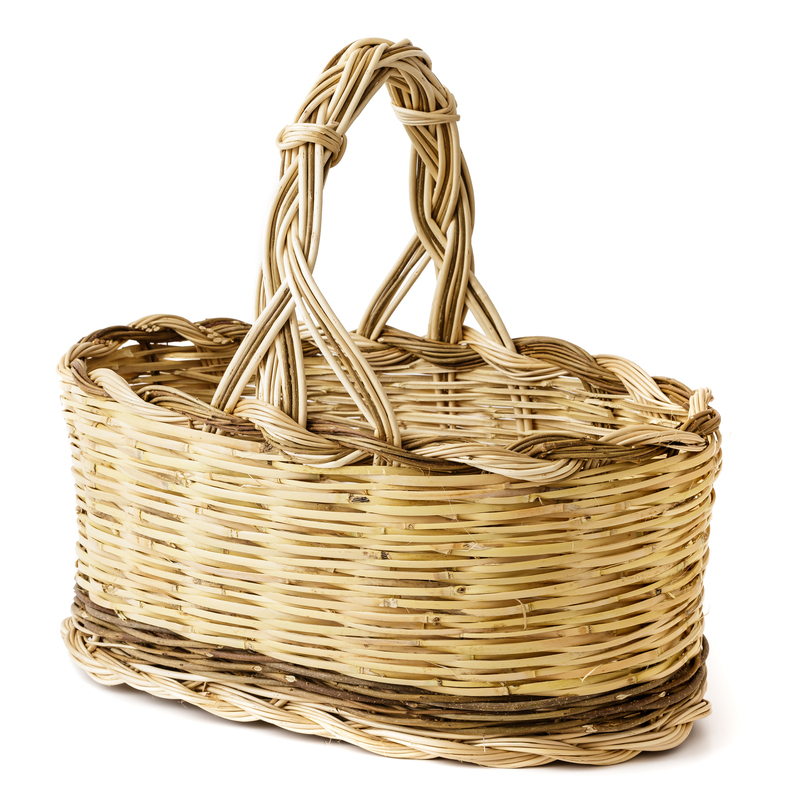 Deep inverted-lid baskets, corbule, large baskets with low edges to prepare bread, precious caskets for cakes cuffini, sturdy baskets with the handles for food transport. In addition, several local versions are designed for specific uses in material culture. The typical features and stylistic jargon of the past are reproduced today with unparalleled mastery and open up to new and interesting reinterpretations.